Yesterday, I posted about Valerie and Jay's wedding. Today, it is all about the details! Valerie's lush red bouquet. 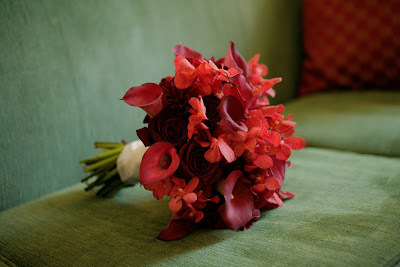 Her bridesmaids' bouquets featured the same shades of deep red plus a pop of green orchids. 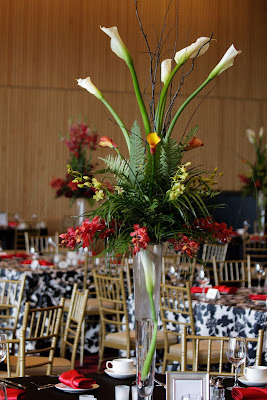 Flowers by G-n-G Designs. 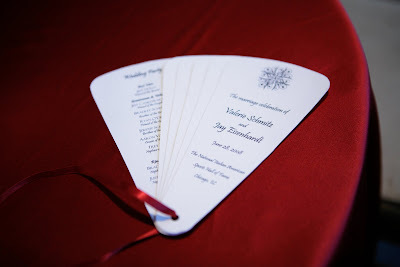 The fan programs were designed to hang off the back of each chivari chair during the ceremony. 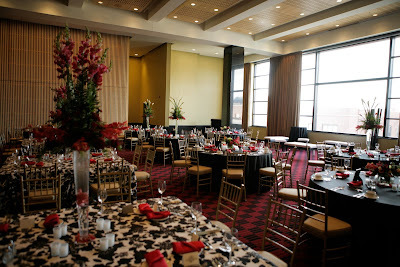 The decor of the room perfectly coordinated with the black, white and red color scheme. I loved the vintage looking floral linens. 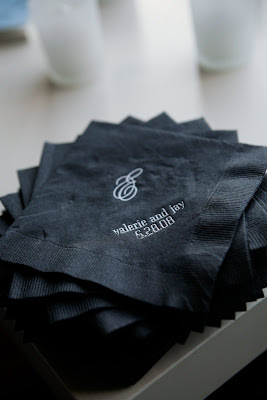 Valerie and Jay opted to order personalized napkins which were placed throughout the cocktail and reception spaces. The bride loved the tiered look of the centerpieces. Chic black and white lounge furniture was set up near one of the bars. Valerie bought a variety of books including "How to Make Love: Secrets of Wooing From the 1930s". They were a huge hit among the guests! 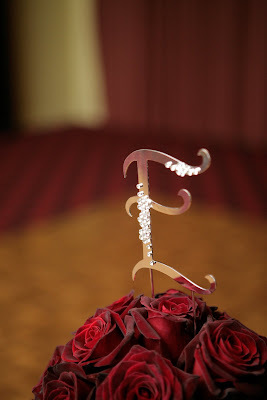 Their cake was topped with deep red roses and a crystal letter "E". I love the damask linens on the square tables! It is beautiful! !